Easy and delicious Chicken Cordon Bleu Casserole Recipe. 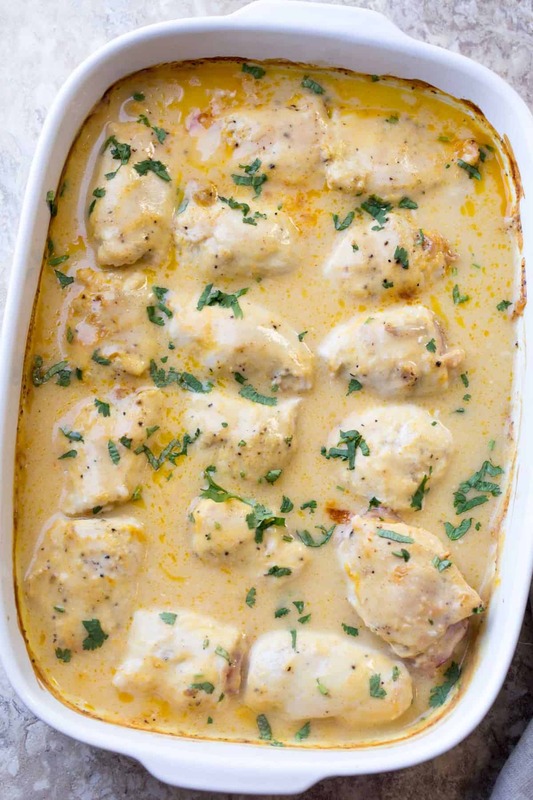 Chicken stuffed with ham and cheese in a creamy sauce that will become a family favorite! This recipe requires no breading or frying and is ready to bake in under 15 minutes. 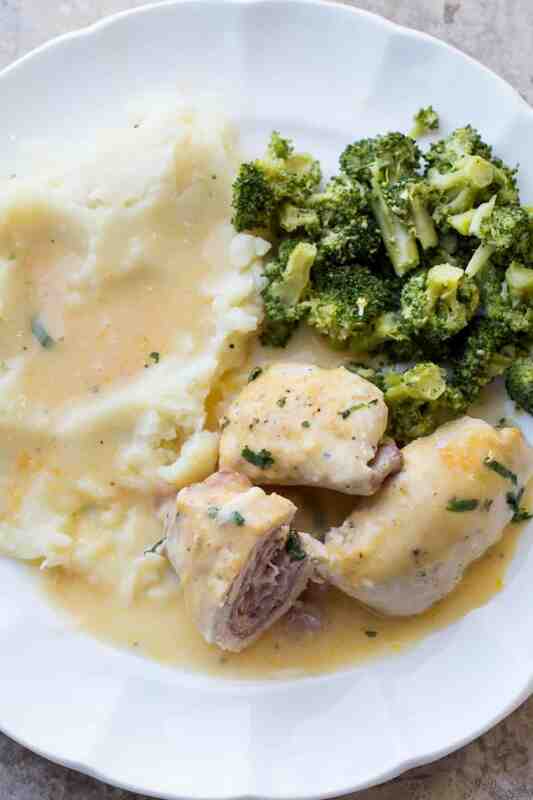 If you like stuffed chicken, you must give this Broccoli Stuffed Chicken in a creamy wine sauce a try! It’s out of this world good. An easy and quick casserole recipe. Seasoned chicken breast stuffed with ham slices and loaded with cheese in a creamy and delicious sauce. The chicken becomes so juicy and flavorful while the cheese oozes and the combination of ingredients make for a mouthwatering recipe. A classic Chicken Cordon Bleu recipe is slightly different than the recipe we are sharing today. It is topped with a Dijon sauce while ours is in a creamy sauce that has no mustard in it. While the chicken is breaded and fried in a classic recipe, we skip the breading in this recipe and bake the casserole in a sauce. Slice chicken breast in half and then in half again. Prepare cream by combining sour cream, seasonings and water. Take chicken breast, add ham to it and cheese and roll up the chicken. TIP: We used a whole slice of ham and a slice of cheese cut in half and stacked. You can add as much ham and cheese as desired. Coat the bottom of the casserole dish with some cream. Add the chicken to the casserole dish. Add remaining cream over the chicken and spread evenly. 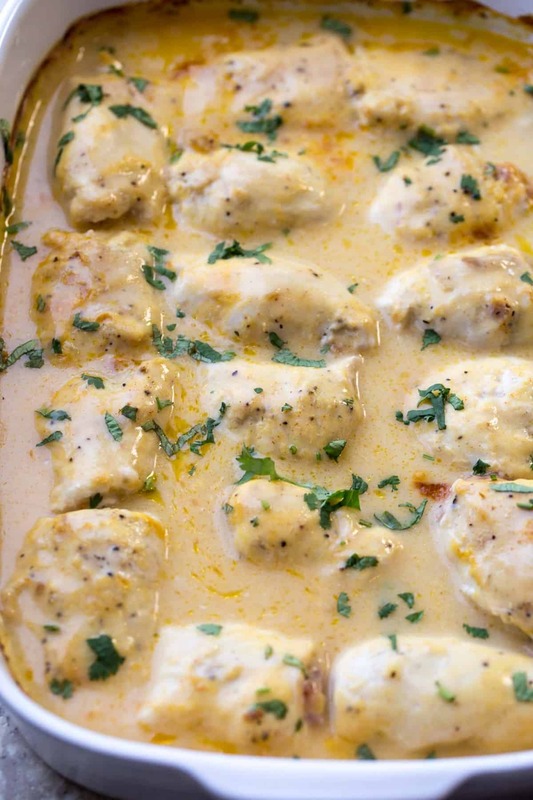 What kind of cheese do you use for Chicken Corden Bleu? Swiss cheese is used most often in a Chicken Cordon Bleu recipe. However, we’ve substituted for Provolone and Mozzarella and had great results. What is the best sauce for Cordon Bleu? 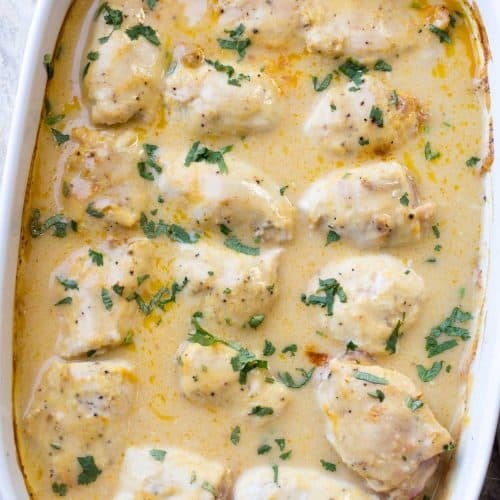 A mustard sauce typically is poured over the chicken but since this is a casserole, the cream we use is slightly different but still as amazing. What side dish goes with Chicken Cordon Bleu? This casserole is best when served with mashed potatoes. The cream may be poured over the mashed potatoes as gravy and it tastes wonderful. However, you can do the same with rice or even your favorite pasta. 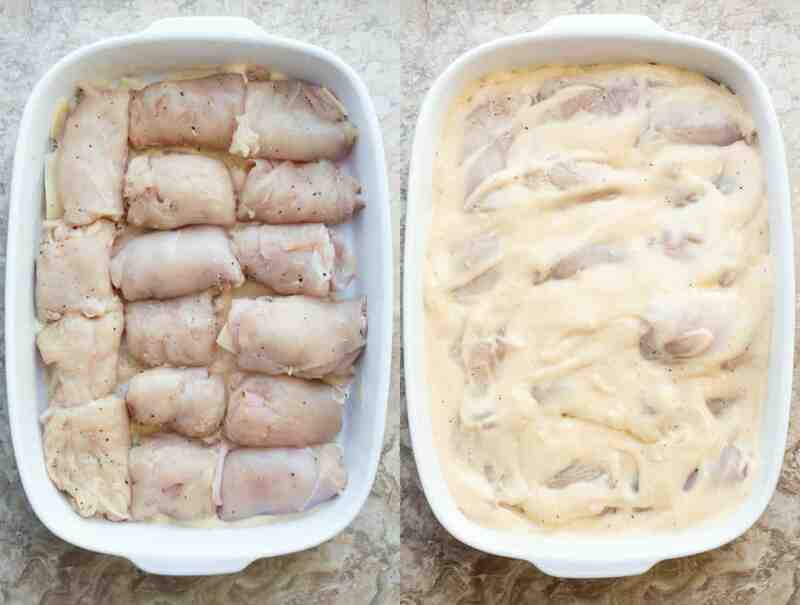 Can I freeze Chicken Cordon Blue casserole? YES! This casserole freezes well. Prepare per instructions, DON’T bake. Cover with foil and freeze. Thaw before baking and bake per instructions. NOTE: Instead of one large casserole dish, you can divide the ingredients into two 8″x8″ or 9″x9″ dishes and freeze separately. NOTE: Updating an old post. Chicken Scampi Recipe-Olive Garden CopyCat recipe. Chicken Stuffed Shells– The Alfredo sauce is heavenly. Chicken Marsala Recipe– For the mushroom lovers. Easy and delicious Chicken Cordon Bleu Casserole Recipe. 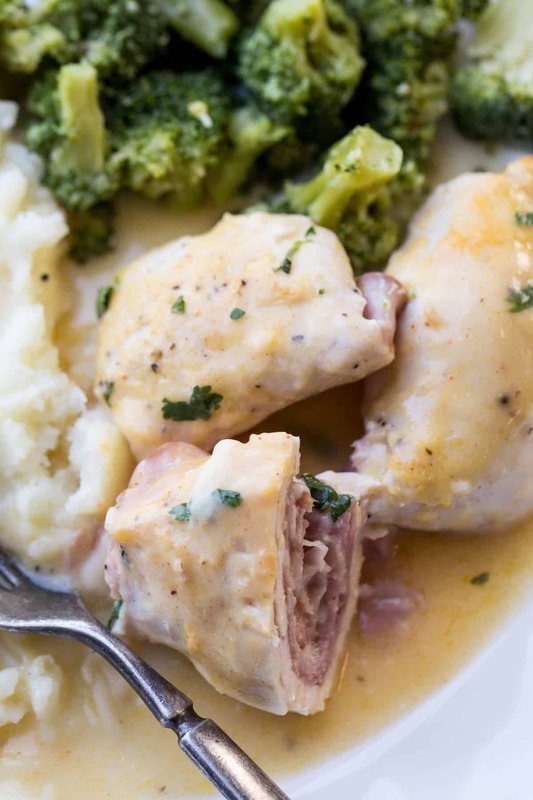 Chicken stuffed with ham and cheese in a creamy sauce that will become a family favorite! Cut each chicken in half lengthwise and beat with a meat mallet. Cut in half again. (You’ll get 4 pieces out of one breast.) Lightly season with salt and pepper. Add half of a slice of ham and half a slice of cheese over chicken pieces. Tightly roll up chicken. Continue with remaining ingredients. In a bowl, combine the soup, sour cream, water, salt, pepper and paprika. Set aside. Cover the bottom of a glass 9x13 pan with a few tablespoons of the cream. Add all of the chicken into the casserole dish with the seam of chicken tucked under. Pour the rest of the creamy mixture over top the chicken. Cover dish with foil. Bake in preheated oven to 365°F covered with foil for 45-60 minutes, (until the cream is bubbling everywhere.) Remove foil and cook another 10 minutes. That looks like my kind of food; served with mashed potatoes and salad. Looks really delicious ? Mary, that’s awesome.. So glad to hear that..?? Wow this looks so simple but yet delicious! Would definetly want to try it! It’s super simple and very delish, do try it Irinka:)..